Shall we take another break from the Menagerie roundup, this time to talk about drafting? 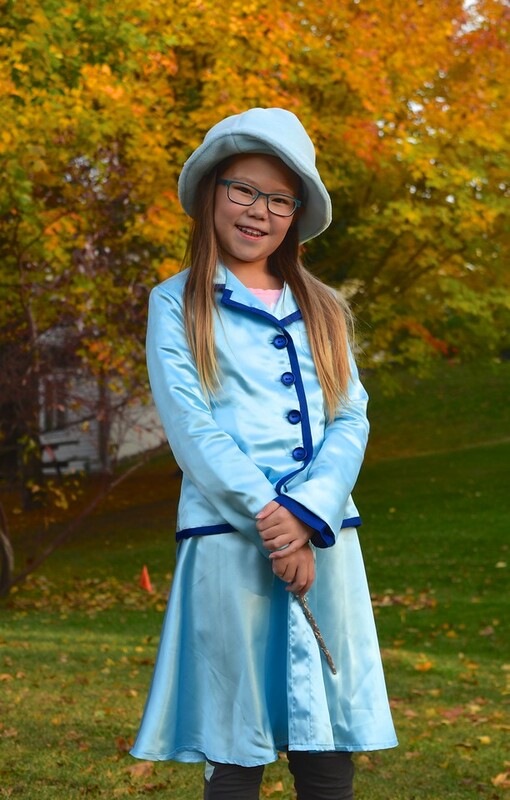 I've been wanting to write this post since I made my kids' Halloween costumes last October. It wasn't so much to share the costumes themselves but to discuss another approach to drafting that I thought might be interesting. 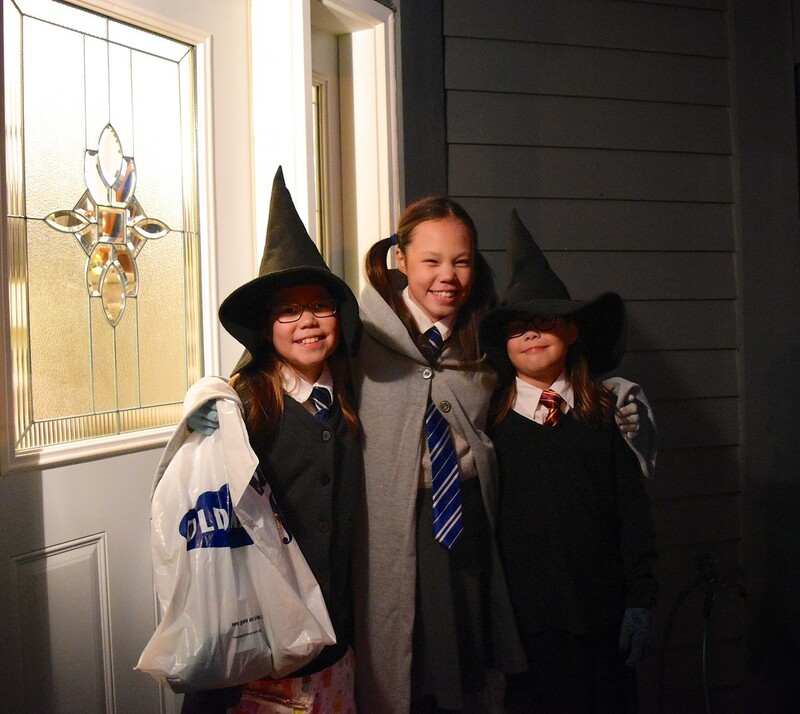 Believe it or not, this is the only picture we have of all three girls in their costumes. 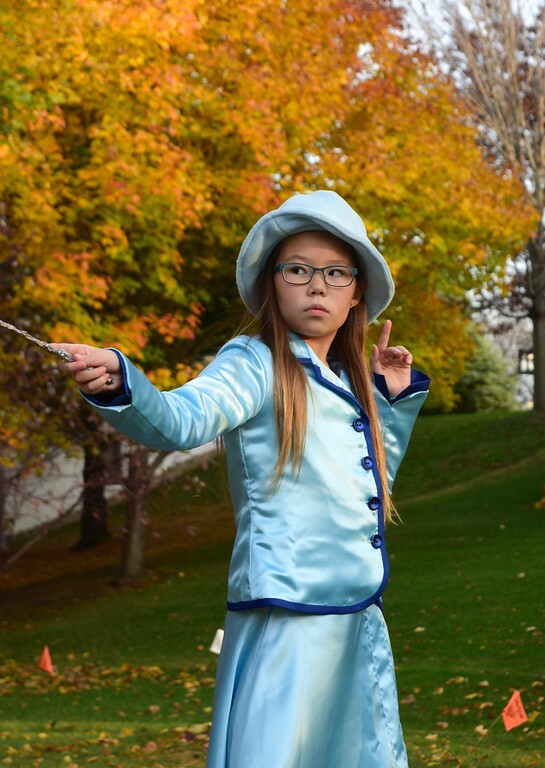 They're all Hogwarts students: Jenna is Cho Chang, Emily is Moaning Myrtle and Kate is Ginny Weasley. the materials: each garment was single-layered. There was no lining or overlays and the fabric itself was regular everyday-wear stuff rather than the sheers, silks or flowy, unstable knits that I typically use for costumes. What I didn't have was the actual children with me during the making. Unlike their much younger princess-dress selves who hung out at home and could be easily accosted for multiple rounds of measurement, measurement re-checks and interim fitting sessions, the children of 2017 were busy Being Elsewhere: school, the neighbors' houses, evening sports, birthday parties. Which meant that I had one chance to measure them and one fitting before the final garment had to be ready. Also, one and a half days to do it (helloooo procrastination, my old friend). I usually am quite systematic when I sew garments. First, there has to be a basic block/sloper made for each child, and because the children keep growing, a new block has to be drafted for each Halloween costume season. I begin with a very detailed list of measurements, and use those to draft the block. Then, I adapt that block into the costume itself. I redraw the seams according to its design elements (e.g. flared skirt, bell sleeves, etc. 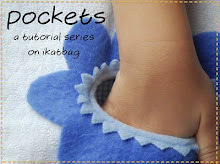 ), and add fitting and design ease for the wearer's movement and style and type of fabric, respectively. 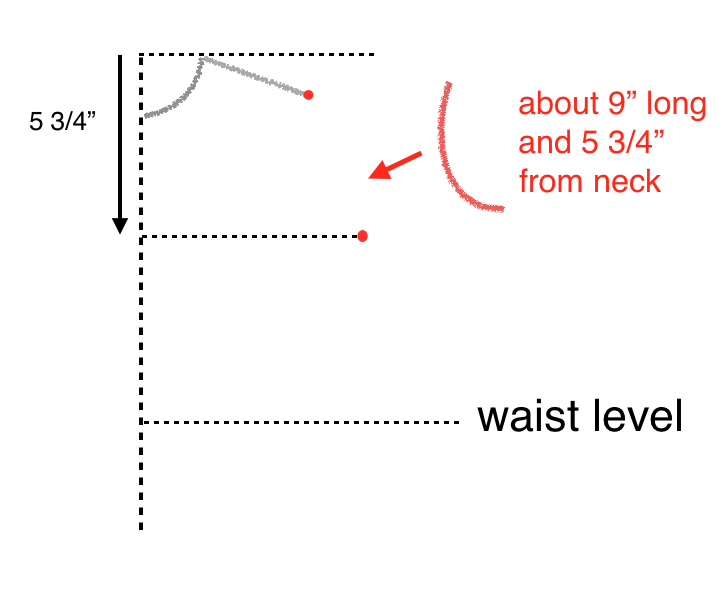 Sometimes this involves grabbing the child again for new measurements that I hadn't taken the first time around because they weren't block/sloper-related: design-related dimensions like the circumference of a semi-circular skirt, the dip of a drop waist, the width of a boat neck. 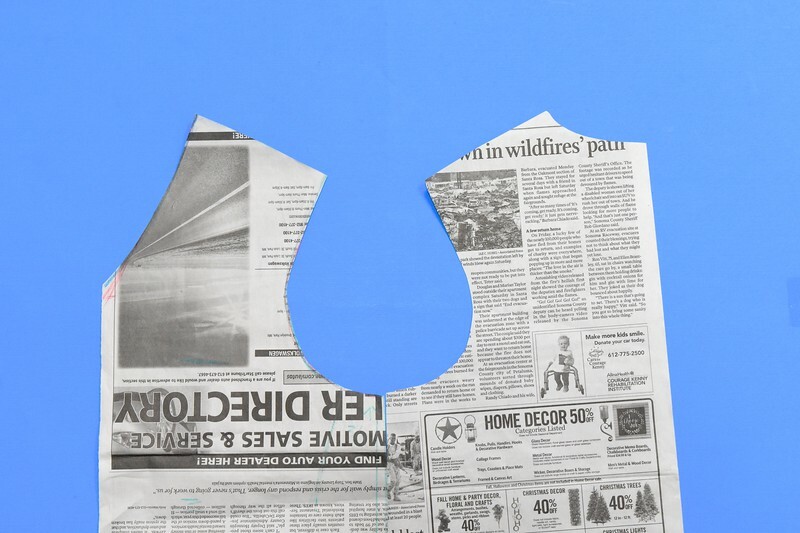 The block then becomes a paper pattern for that particular costume. Next, I lay that paper pattern on the fabric and cut. Then down goes the presser foot and - finally - we're in business. Again I grab the child, for a fitting this time - sometimes multiple times, especially when working with fluid fabric whose behavior cannot fully be accounted for during the drafting process - and I make adjustments. Eventually, when I can find no more adjustments to sensibly make, I declare the garment finished. The pattern gets thrown into the trash (because we can't use it next year - the kids will have grown again), the leftover fabric gets tossed into the remnant bin, and I return to cardboarding or whatever else seems like a fun way to unwind. That's my typical garment-sewing process. 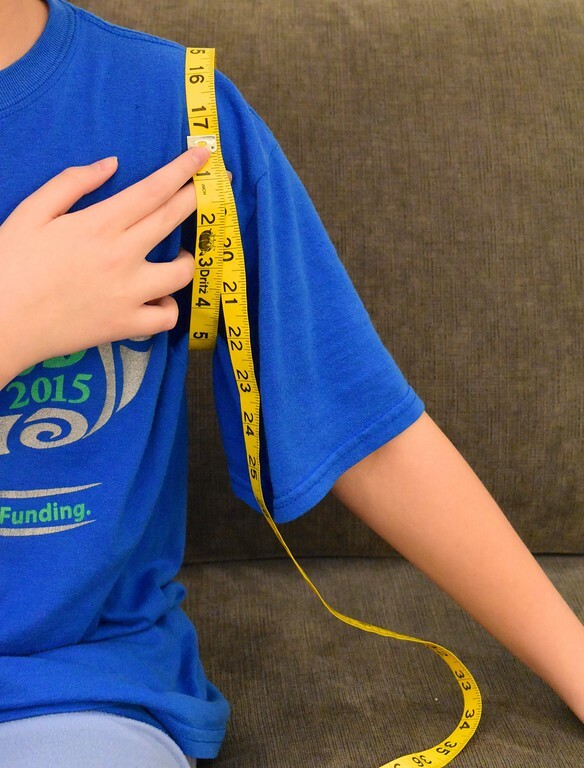 It's systematic because there are rules, procedures and sequences in drafting: what to measure on the body; where on the blank kraft paper to transfer that number to create a seam line, how to pair it with other numbers to produce a dart. It's like making a cake from a recipe: you read "two cups of flour" in your cookbook and you dump two cups of flour into your mixing bowl. Sometimes, however, I am not systematic. Sometimes it's because I don't want to take the time to be. Sometimes I just want to draft like I did in the old days - by feel rather than by rules. Oh, there would still be a method, certainly, but no recipe. Just what looks right and what should be. What did that look like in practice? Let me recount. First, I measured the children (see - still methodical, right?) But what a short list it was, compared to the wall of numbers from previous years! Just the bare minimum this time: shoulder width, armhole circumference, chest, sleeve length, cuff, length of garment - measurements you'd expect to find on the back of a pattern packet. Took me five minutes at most. Then I scribbled other numbers - shoulder drop, neck width, dip of neckline - which were estimates, not actual dimensions; I looked at the child's body, visualized the paper pattern, and wrote down what the shape of it looked like as numbers. Next, I spread out newspaper (couldn't be bothered to locate the fancypants kraft paper), found a random pencil, and started drawing a garment pattern. Not a sloper. Skipped that and drew the actual pattern instead. Is it legal? Does it even work? Of course it is, and yes it does - provided we know how the numbers on the body translate to lines and shapes and spaces on paper. Visualizing is the key technique in drafting. If you can visualize it, you can draft it. If you can't visualize it, all the drafting rules in the world will only get you partway there, if at all. Incidentally, it took me less than 5 minutes to draft the front of Jenna's cardigan. Not saying that to brag, but to explain that drafting can be very fast. 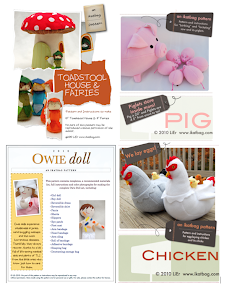 It doesn't have to be laborious and frowny and slow. It doesn't have to involve a spreadsheet of measurements and french curves and calculators and pondering. Oh, my word, the pondering. I used to ponder. It absolutely ruined drafting for me, let me tell you. Drafting is meant to be liberating, so you can get through the wretched patternmaking in record time and onto the actual sewing. Because that's why we make garments, isn't it - so we can actually sew them? Anyway, as I was drafting the sleeve cap for Jenna's cardigan, I thought, "This would make a good blog post, actually. I wonder if people might be interested in watching me draw on newspaper if I explained my thought processes - you know, like how I drew a sleeve cap and what decisions drove each curve and distance and line." So today I thought I'd show you how I draft by feel. To clarify, nothing in this post is really new technique, only perhaps a different approach to achieving the same end product. Think of it this way: I've taught you to draft by numbers (like paint-by-numbers!) and rules, which is all good, but it takes time, and all you're doing is really just following my recipe for making a pattern. Let's do one better and learn to cook, shall we? Here follows a re-enactment of the drafting process that took place last October. The newspaper patterns here are the actual ones that became our 2017 Halloween costumes. For the sake of time, I want to focus on the armhole and sleeve cap because those are the issues on which I've received the most email requests for comment and help. Let's start with the finished garment - in this case Jenna's charcoal cardigan. The fabric she picked was a thick sweater knit and I drafted the cardigan to fit over a button-down shirt (and possibly more insulation underneath - in Minnesota, one has to draft for inclement weather one cannot yet predict). The second thing you might notice is that the fabric is thicker and sweater-y, like a real knit cardigan. In short, this cardigan was drafted as a casual-fit garment, designed for comfort rather than the aesthetics of a custom fit. It was also drafted to be an over-garment with ease to accommodate the various other-garment layers underneath. 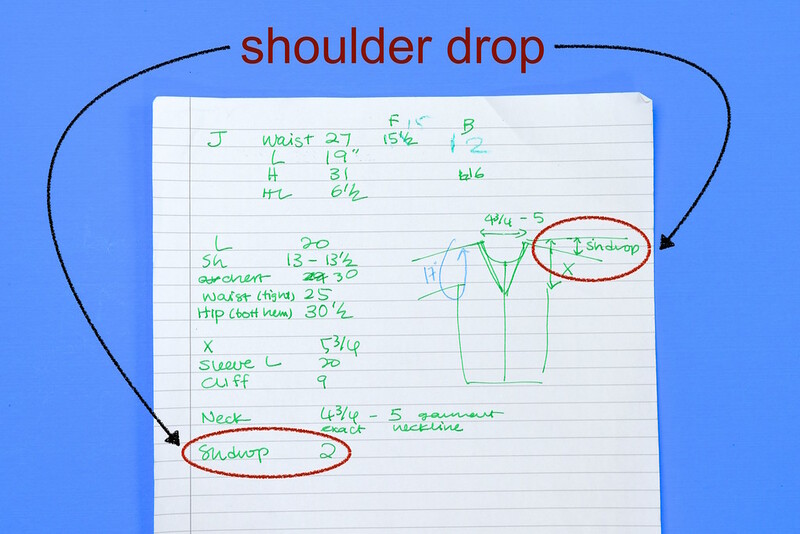 One of the most important things to get right in a bodice draft is the shoulder slope. The shoulder drop is my shortcut method for measuring this. It's a good estimate and usually adequately precise for a casual-fit garment like a Tshirt - or this cardigan. I had Jenna stand with her back right up against a wall, located the horizontal line from the side of her neck (I believe I grabbed a random flyer off the coffee table and held it at this level, and measured down to her shoulder point: 2". 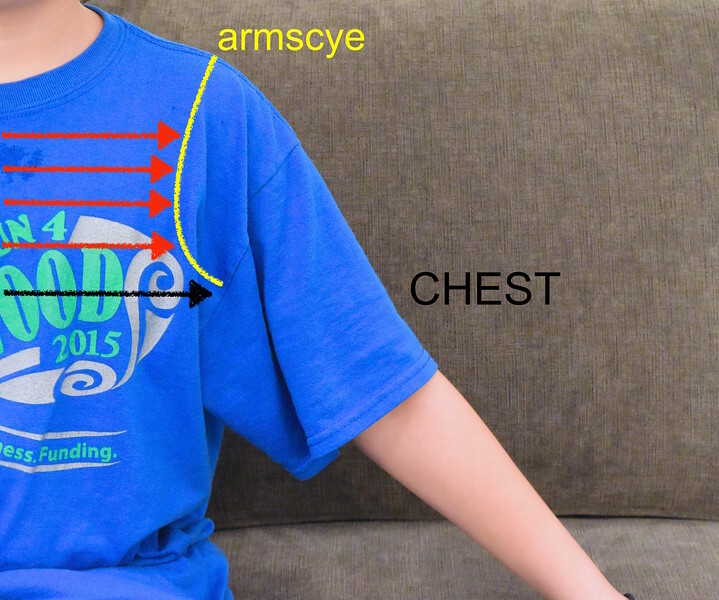 Now that we have the location of the shoulder point, we need the position of the bottom of the armscye. The chest measurement gives us its horizontal position i.e. how far it is horizontally from the Center Front line. 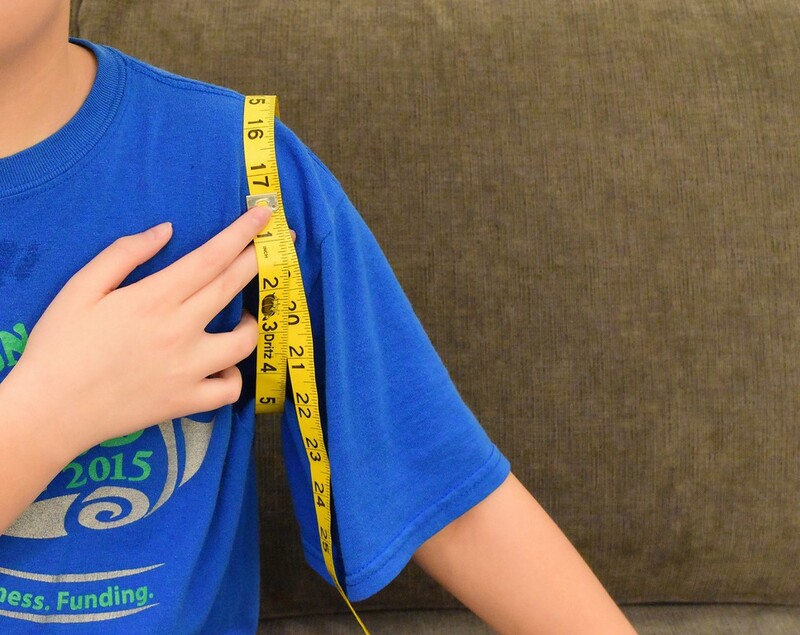 For a pre-pubsecent child + this loose-fit garment, I literally measured a comfortable chest circumference and quartered that. not differ significantly from the 1/2 (Front Chest Measurement). Some drafting resources suggest formulae or rules of thumb that tell you how many inches below or above each of these levels to plot this point. It's all good, but I always found myself asking, "Yes, but how came you by that number? Why x inches? Why not y inches? " Here is how I like to determine this Bottom Of The Armscye Position: I measure around an imaginary armhole on the wearer. 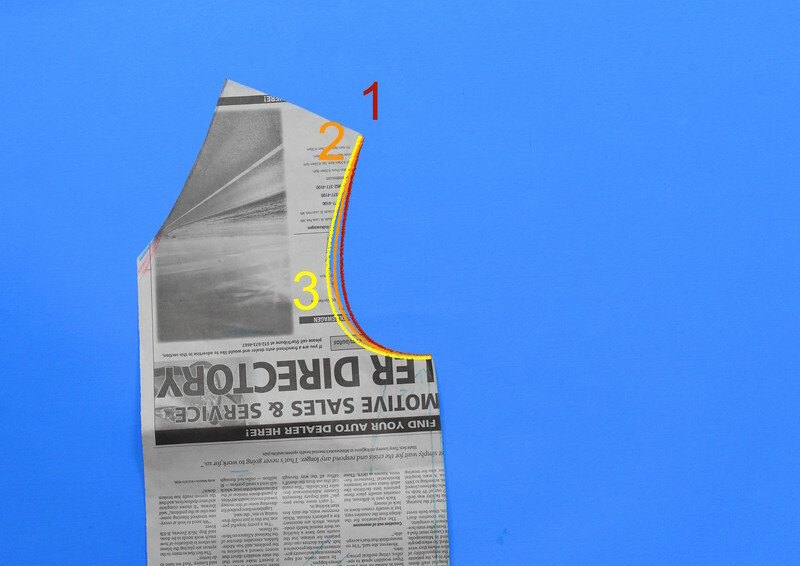 I like this method because it is visually meaningful to me: it represents an actual loop of fabric that will surround the upper arm of a real wearer. 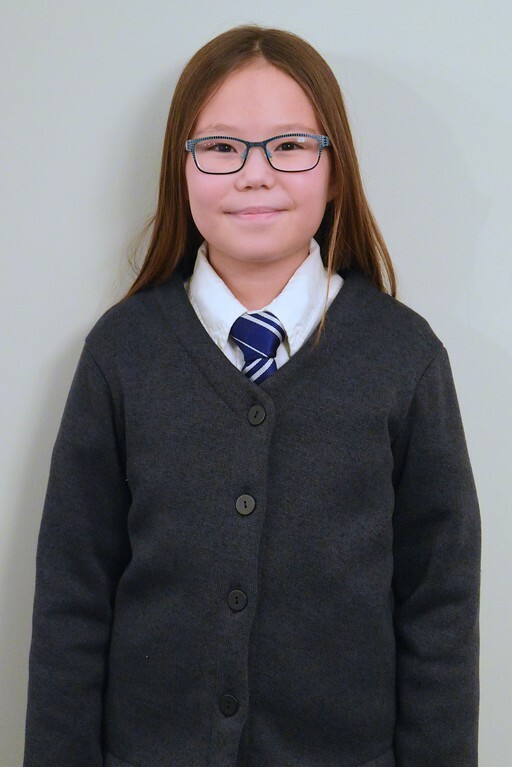 It takes into account the wearer's clothes (remember in this case, the cardigan will be worn over a shirt, which is why Jenna is being measured around the fabric of her shirt), and also the wearer's shoulder shape, muscle tone, distribution of flesh, posture, etc. With this method, I can ask Jenna, "Does this feel comfortable? Is it too tight?" and her feedback will help me determine how snug or non-snug I need to make this armhole. Always remember that even though you will draft the front and back bodices separately, you are ultimately drafting a whole armhole; the front and back armscyes by themselves are meaningless. How snug do I make this loop? Ah. Good question. Remember the golden rule of drafting armholes: always aim to make the smallest possible armhole that is still comfortable. So start snug and then loosen the loop of tape until you have what you think will be a practical armhole size. Ask the wearer if the loop feels comfortable to them. Ask them to move their arm around and watch for impediments. And it goes without saying that the wearer needs to be wearing whatever they will be wearing under the finished garment - underwear, camisole, Tshirt, sweater, etc. I now record that measurement. and record that vertical distance. 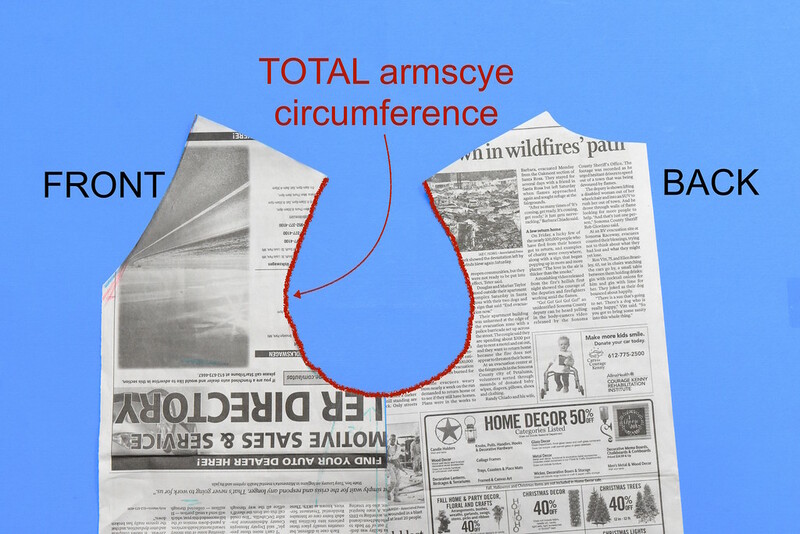 Now that vertical distance is no longer an arbitrary number but a dimension that is meaningful to me because it's directly related to the circumferential size of an armscye that I'm confident is comfortable for the wearer. Now I visualize the shape of an armscye that is roughly half the whole armhole measurement, so about 8.5". 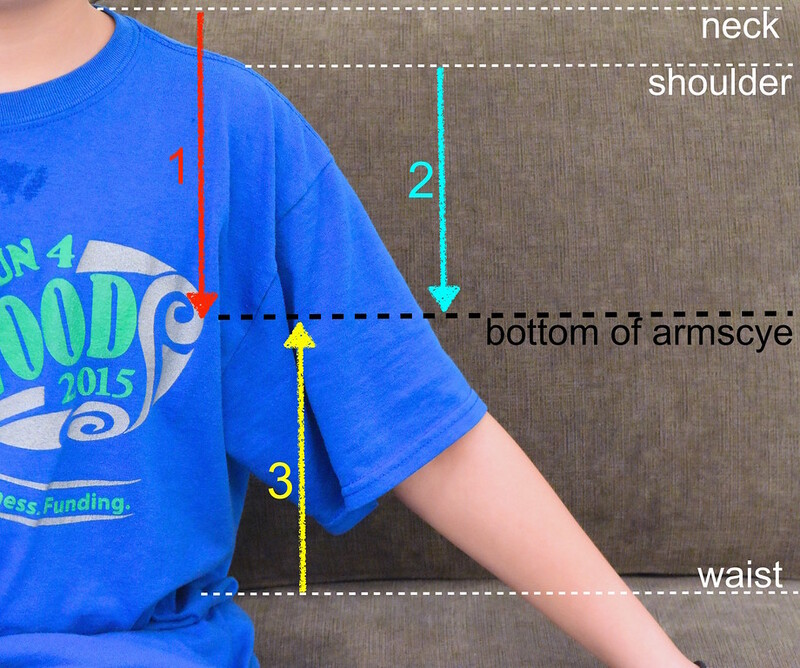 However, because the front and back armscyes are never identical, with the front usually a little longer than the back, I usually round that half-measurement up. So rather than 8.5" for the front and back, I might choose 9" for the front and 8" for the back. Or 8 7/8" for the front and 8 1/8" for the back - whatever numbers are required to produce a curve that ends 5 3/4" below the side-of-neck level (see next point). Now that we know the dimensions of the curve we're drawing, what will be its curvature? Since we know that armscyes have pretty standard shapes, we'll start there. Some drafting resources instruct measuring the high bust and high chest and other such distances. 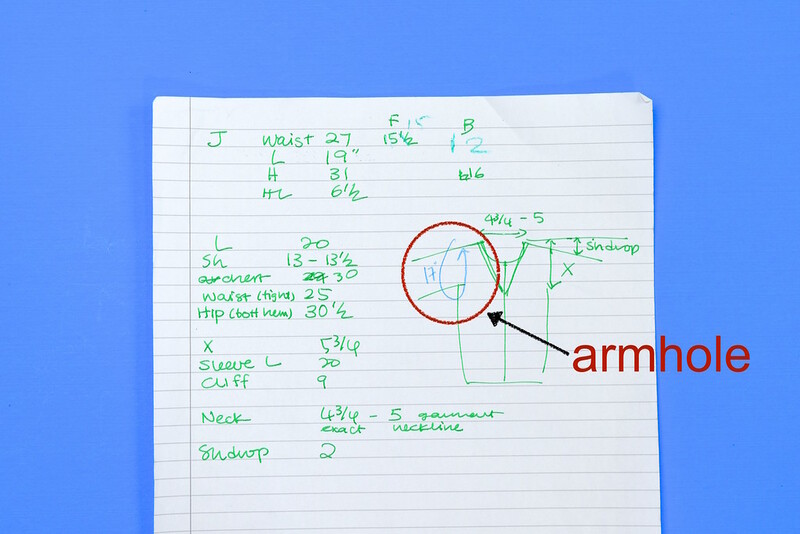 This gives you additional points to plot on your draft that help you refine the shape of the armscye curve. See red arrows in the photo below. Perhaps it's just me, but I've often wondered if there were also rules governing the exact level of, say, the high bust measurement. 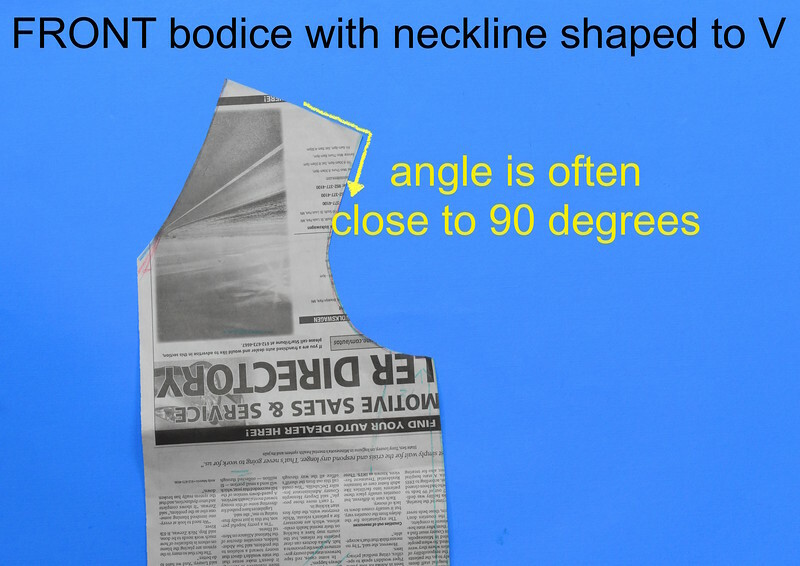 Is it, for instance, always exactly 2" above the bust apex? For all women, regardless of height or size? What about women with perky vs. saggy busts? What about children? What about toddlers vs. tweens? See red arrows in the photo below - which one do I use? 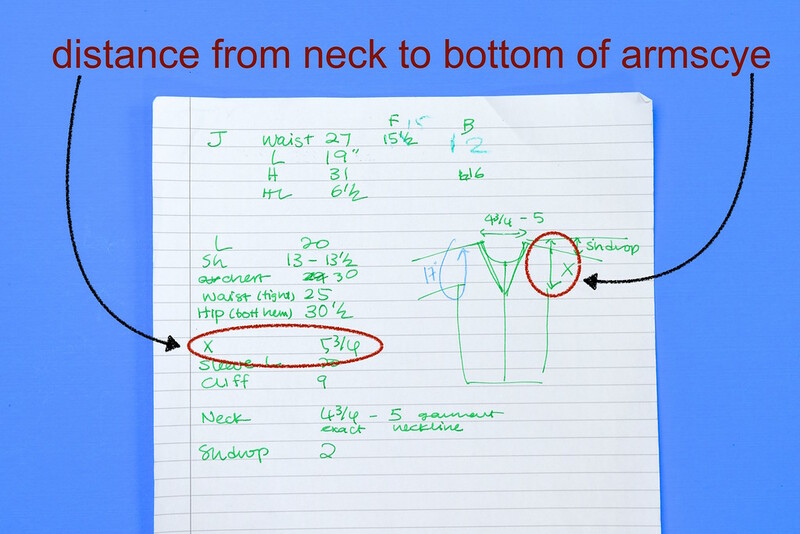 And where exactly are the end points of a front high chest measurement? 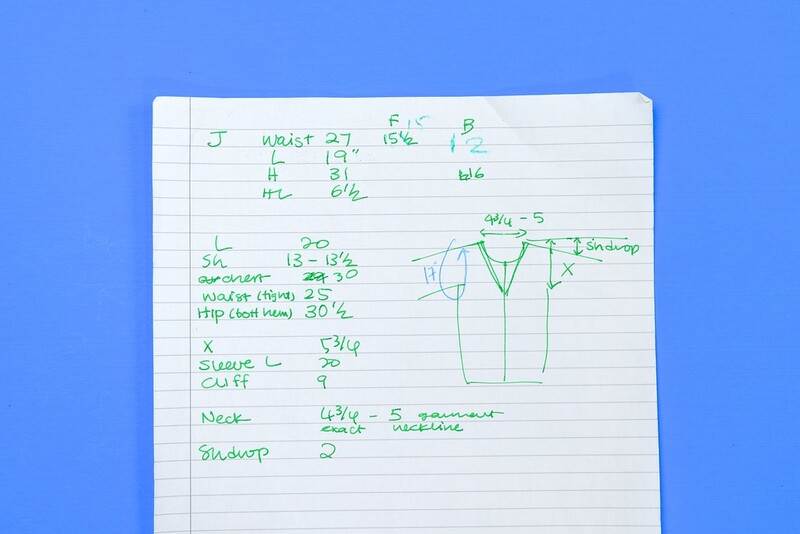 Do you have the model wear a garment and measure between the armhole seams of that pre-existing garment? Always? Regardless of the fit of that garment? I have very, very rarely, if at all never used a high bust or high chest measurement when I draft. Not because it is a bad measurement, but because it was never visually meaningful to me. It might be a meaningful measurement for you, in which case, please continue using it, okay? Let's move on! Here is Jenna's front sloper - unfortunately, I chopped off the jewel neckline in an earlier stage of drafting in favor of the final V-neck, but the armhole at least is still intact. Let's - at last - draw that armscye. Typically, I begin the armscye from the shoulder point, and draw down at roughly 90 degrees. Not always; sometimes a person's shoulders are so slanty that a 90 degree line would continue into a very weird pseudo-cap-sleeve-looking armscye. 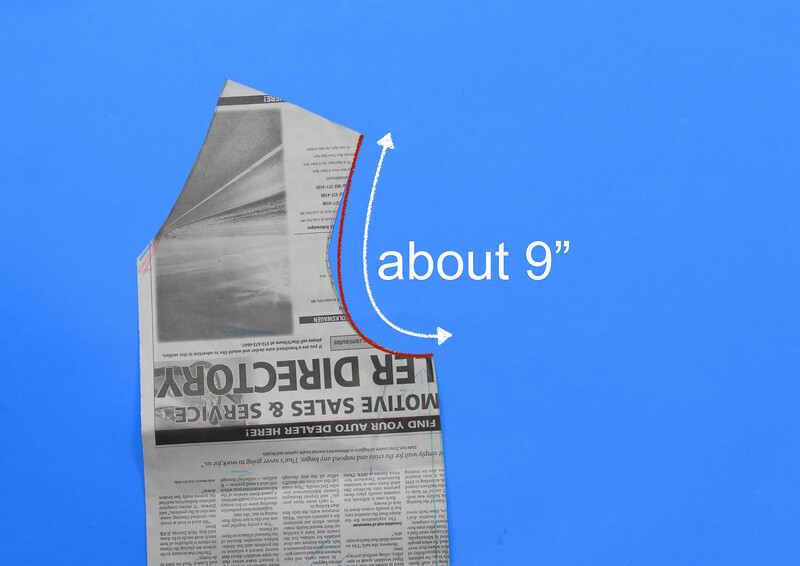 But 90 degrees is a good starting point, and you can refine the slant of that line or the general armscye shape later. 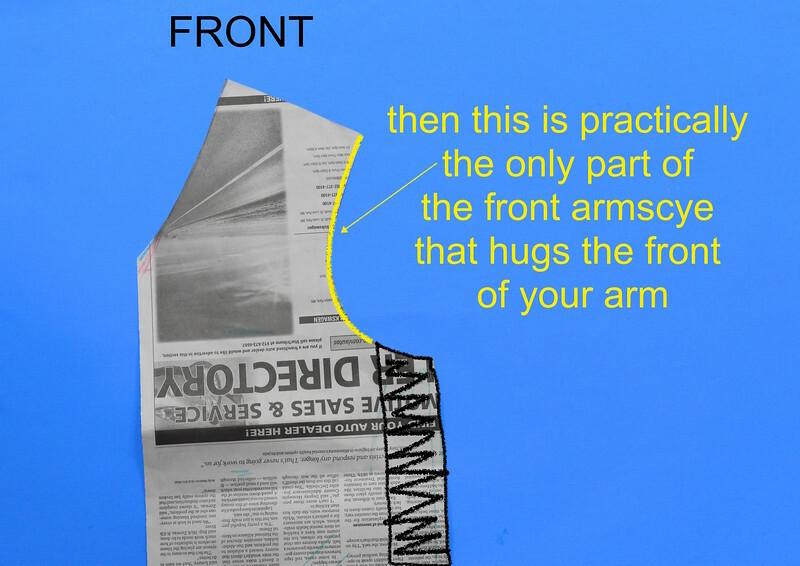 Finish the armscye by creating that armpit scoop and ending at the side seam at also (roughly) 90 degrees. Don't worry about the shape. What's more important is the length of that armscye curve. In the next photo, the red line is an example of an armscye I might've drawn early in the process. Suppose that after measuring its length, I realize it's not quite long enough to meet the "almost 9" requirement. So I draw a few more, each line longer than the one before. Notice that I create longer lines by making deeper curves, and NOT by lowering the bottom of the armscye (we'll return to this idea later when we draft the back armscye). I measure each line until I have one of the right length. Did you also notice that I continually measure the length of the armscye as I adjust its shape? This is important, because we're drafting an armhole of a certain size and we need to keep this constant even as the shape changes. Incidentally, when I was beginning to draft, I always thought armholes looked enormous on paper compared to the arm they would eventually enclose. I mean, that armscye drops almost 6" below the neck and cuts way into the chest area! So great were my doubts that I actually disregarded the measurements and made corrections to my draft toward a more "conservative" size. It took some dramatically-failed muslins to eventually learn to trust the numbers! Moral of the story: had I been able to visualize what those 2-D lines and numbers looked like in 3-D, I could've spared myself a lot of grief. 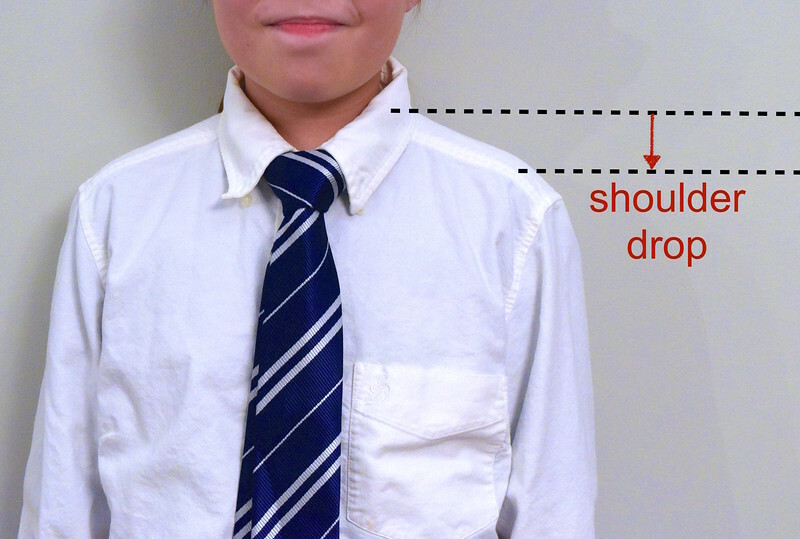 And really, that final yellow line isn't a lot of curved distance, nor is it as "cut-in" as I'd thought, even for a child, and especially for an overgarment that has to accommodate a billowy button-down shirt. See? 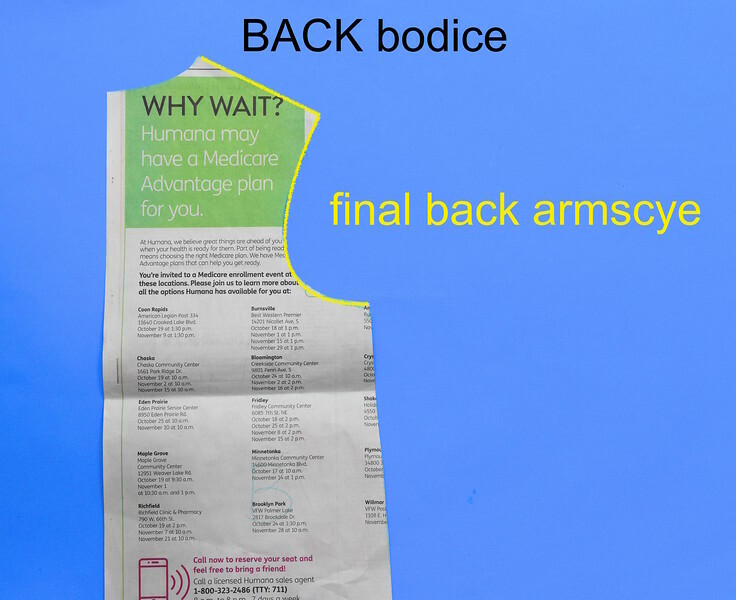 Let's do the back armscye now. Here is my draft. 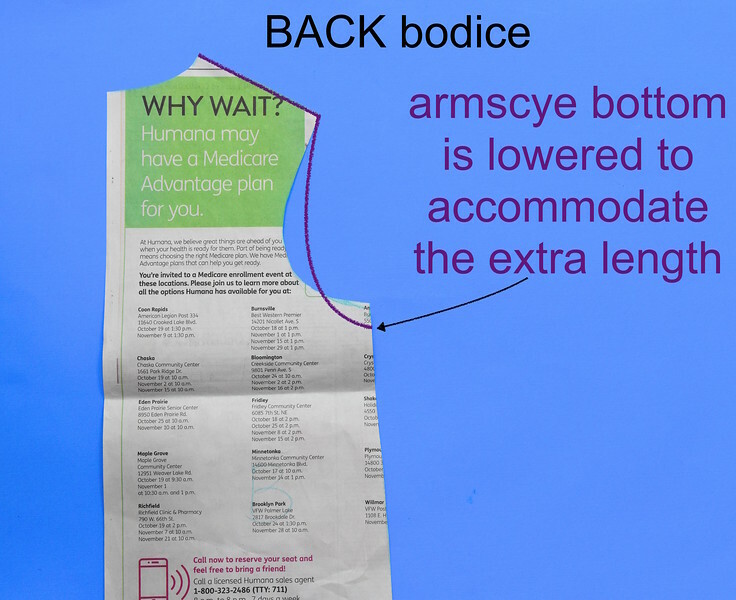 Typically, the back armscye is a fair bit straighter than the front. 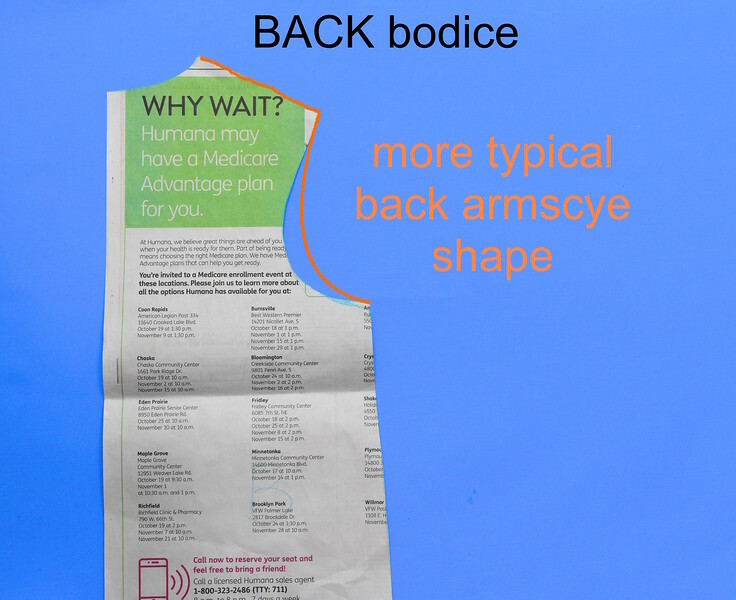 This is because the scoop of the front armscye accommodates the shoulder's ball joint and the forward motion of the arm that the back armscye doesn't. For this draft, however, this orange line would've measured 7", maybe 7.5" in length - way too short for the 8 - 8 1/8" needed to ensure an overall 17" armhole. 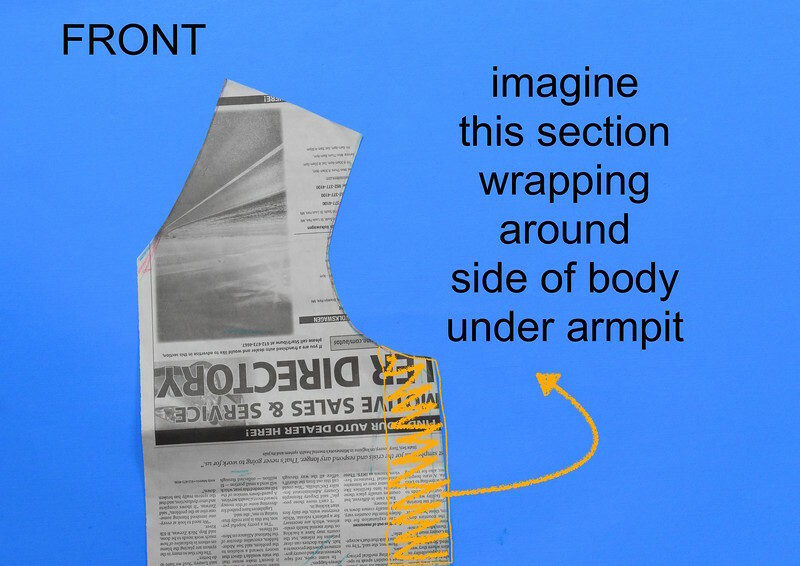 I'm bringing this up because sometimes this happens in drafting: you follow the rules to a T . . . and they produce a garment that is acutely uncomfortable. 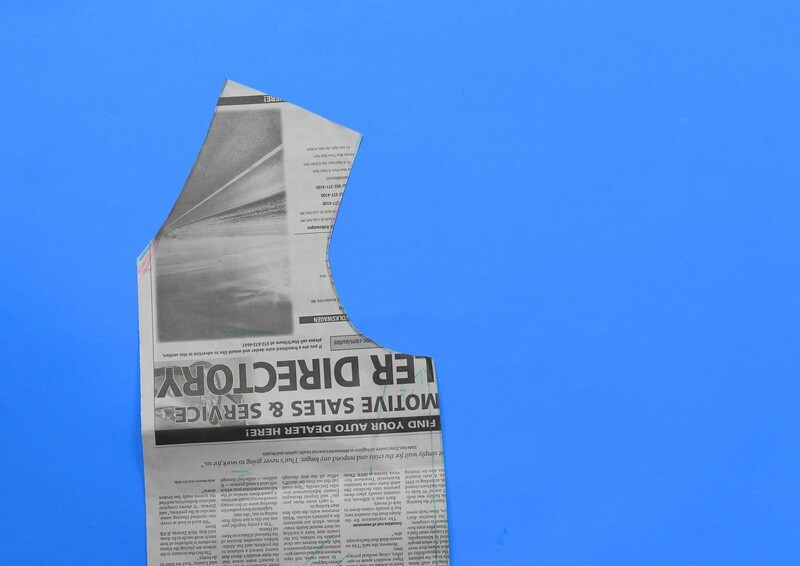 Then you find yourself stuck in a legalistic quandary just like this one: use the typical back armscye shape and get a tiny armhole, or break the rules a little and actually be able to move your arm? But which of the one millionty thousand drafting rules to break? Here's one possibility: keep the straighter (typical) curve but lower the bottom of the armscye. Numerically, it works. But now the side seam is shorter. Which means we need to lower the bottom of the front armscye, too, in order for the side seams to match when sewn together. 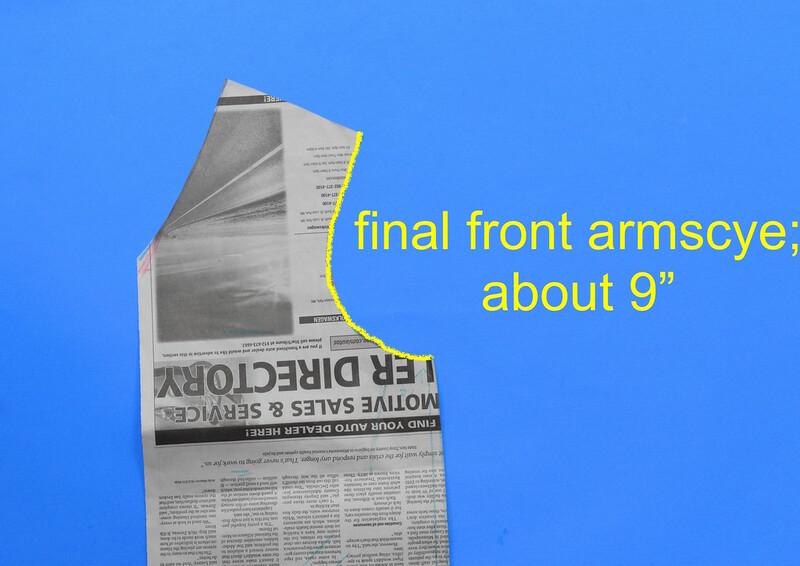 Which means lengthening the front armscye in the same way as you did the back. Which means increasing the overall size of the full armhole. Which flouts the golden rule of armholedom: always draft the smallest possible armhole that's still comfortable. So no-go. 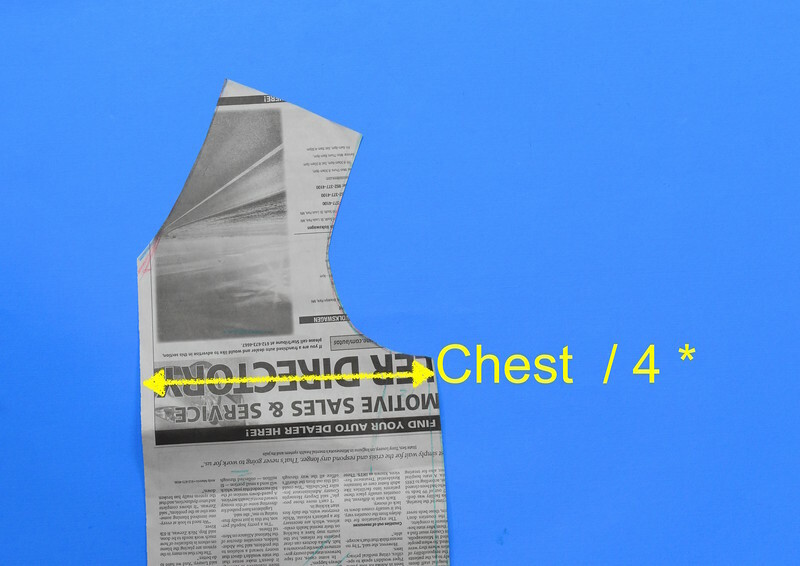 Instead, we re-shape the back armscye so it's more curvy (and less typical), and so attain the 8" or 8 1/8" independently of the dimensions of the front bodice. Here's the total armhole, made by bringing the front and back bodices together at their side seams. At the risk of sounding trivial, allow me to recap our goal for this portion of the draft: to create an armhole that was 17" around and whose bottom was vertically about 5 3/4" from the neck. 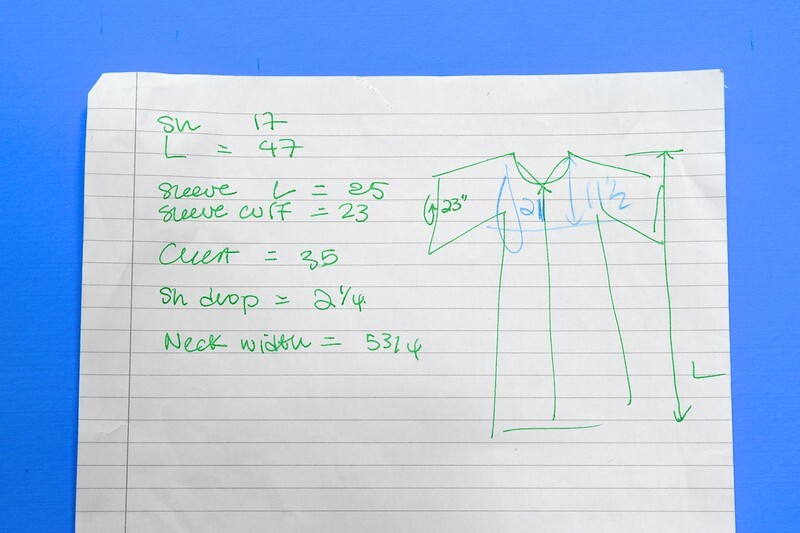 Which we did, without fancy rulers or formulae - just visualizing, and drawing on paper exactly what we wanted the fit of the garment to be around Jenna's arm and shoulder. And because this post ended up being longer than I'd expected, I've split it into two parts so we could stop here. See you back here for Part 2: The Sleeve! Thank you so much for this post, armholes and sleeves are always such a conundrum for me!! I LOVE LOVE your posts about designing patterns!!! "one millionty thousand drafting rules to break..." HaHaHa!!! So True, because now and then we want to do it on our own. Cat & Kittens KIT Now Available!